This gorgeous drive winds you through the heart of the mountainous South. From sleigh rides to hot chocolate, it's the perfect family trip to take this winter. Barbecue and sweet tea are ubiquitous in the South, but snow can be a bit more elusive. The mild winters are part of the charm of living below the Mason-Dixon, but a proper powdery experience can still be found. Case in point: the South's very own snowbelt, a string of mountains in West Virginia that typically receives 160 inches of snow a year from December to March. 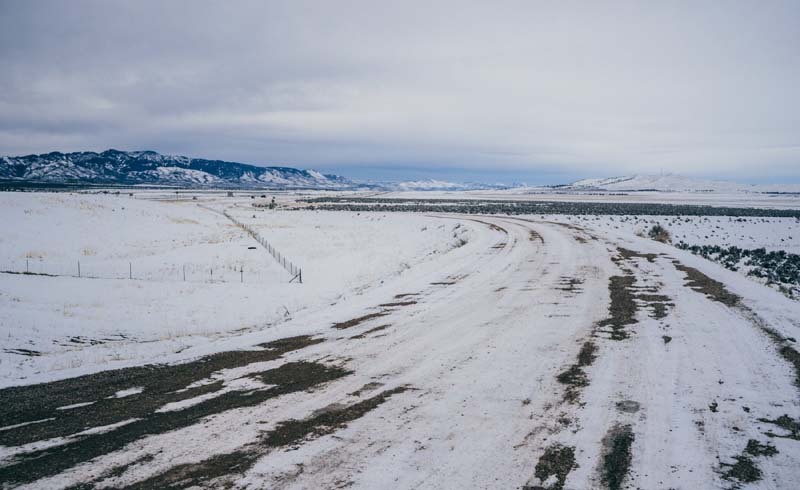 This three-day road trip brings you through those frozen hills. Thomas is a former coal town that's found new life as a winter sports destination for the non-Olympic adventurers among us. Dive headfirst into the snow at the sledding hill at Blackwater Falls State Park, which is lit for night sledding. Make sure to rent toboggans at the Warming Hut. While in the state park, take the short stroll to the 60-foot-tall Blackwater Falls, often frozen in winter. Indulge in some après-sled shopping at Buxton & Landstreet Gallery & Studios (304/657-4572) in the former Davis Coal and Coke Company store, where you'll find work from Appalachian-based artists. (The perfume bottles by glass artist Ron Hinkle would make great Christmas gifts.) Head into Canaan Valley for dinner at White Grass Cafe. You can't go wrong with one of the soups—we suggest the andouille sausage stew. Grab a room at Cooper House Bed & Cocktail, a new hotel on Thomas' main road with just four rooms. If you have enough energy, walk next door to catch a show at The Purple Fiddle, a tiny bluegrass venue. Wake up with steaming hot coffee and a flaky pastry from TipTop—we suggest the coconut custard-filled mini brioche donut. Then drive two hours to Snowshoe Mountain Resort, where you'll find a cobblestone-lined mountaintop village and the most skiable terrain below the Mason-Dixon. Snowshoe's ski school is guaranteed to safely get you down the hill smiling. The reason lies in its method of teaching: The resort is an early adopter of the progressive Terrain Based Learning system, which eases new skiers and boarders into the sport using basic snow features designed to remove the potential stress of learning how to ski. No more zooming down the hill while an instructor yells "Snowplow!" at you. After mastering the mountain, wrap your hands around a warm cup of hot chocolate ($3) at The Boathouse (304/572-5746), a slopeside restaurant at the base of the Ballhooter Lift overlooking Shavers Lake. For a more relaxing experience, head to the new Spa at Snowshoe (304/572-4700) in the heart of the village, where a Hot Stone Massage ($175 for 90 minutes) will make you forget about the freezing temps outside. Be sure to carve out three hours at the end of the day for a 2-mile off-road tour, deep into the backcountry, to a multi-course dinner at the Sunrise Backcountry Hut (from $219/couple). Expect winter favorites such as beef stew and pecan-encrusted tilapia, washed down by local beer, in this rustic cabin surrounded by evergreens. At the end of the night, curl up in front of your own fireplace at the brand-new Corduroy Inn, which offers a boutique experience at the top of the mountain. After breakfast at the hotel, head south down the mountain toward arty Lewisburg, a small rural town known for its galleries. On the way, make a pit stop at Smooth Ambler Spirits, a bustling craft distillery just outside of town. The distillery has a range of popular bourbons, but we like its Greenbrier Gin, which uses locally sourced water, grain, and botanicals for a supremely mixable gin that packs a citrus punch. In downtown Lewisburg, finish your holiday shopping at Bella The Corner Gourmet, where you can pick up a locally made black mustard called The Pig Cave, along with Smooth Ambler bourbon balls: chocolate-covered, whiskey-infused caramels. Have them wrapped immediately so you're not tempted to keep them for yourself. Spend some time lounging in the stately lobby, or simply wander the classic resort. Then rent a pair of skates and take a few spins on the massive outdoor ice rink ($16), or go full Bing Crosby and take an old-fashioned sleigh ride through The Greenbrier's expansive grounds ($48/person). Cap off the trip with a long, relaxing soak in one of The Greenbrier's signature sulfur tubs ($50/25 minutes), which will work out all of the kinks from sledding and skiing over the weekend. 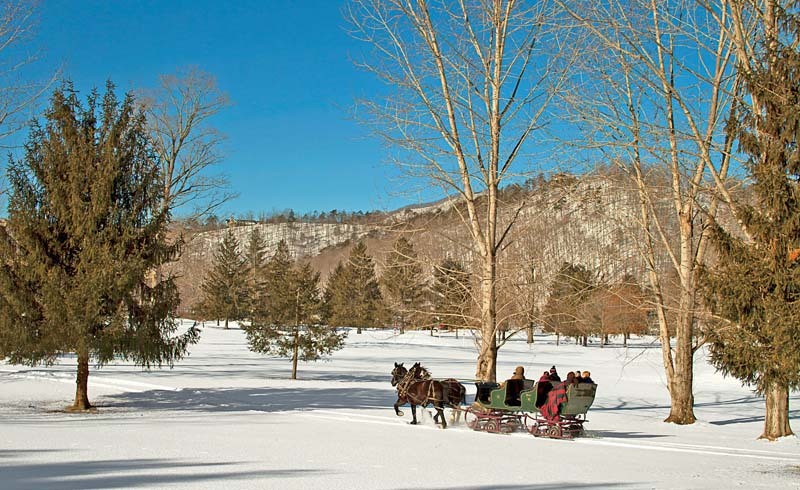 Take a sleigh ride at The Greenbrier.